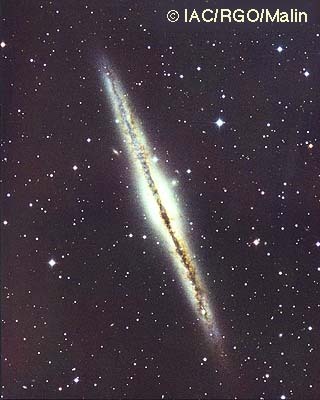 NGC 891 is a fine edge-on spiral with a faint dust lane along its equator. It was discovered by William Herschel on October 6, 1784, and cataloged as H V.19. However, in the appendix to his first catalog, he confused it with his H V.18 (M110, NGC 205) when discussing the discoveries of his siter Caroline Herschel; this remark was picked up by Admiral Smyth and later authors so that it was wrongly attributed to Caroline for a long time. Our image was obtained with the Isaac Newton Telescope under cooperation with David Malin. This image is copyrighted and may be used for private purpose only. For any other kind of use, including internet mirroring and storing on CD-ROM, please contact the Photo Permissions Department (photo at aaoepp.aao.gov.au) of the Anglo Australian Observatory. Gilbert A. Esquerdo and John C. Barentine have investigated NGC 891 in the infrared part of the electromagnetic spectrum, and suspect that this galaxy might have a bar (and thus be of Hubble type SBb) which is not seen in the visible image because of its edge-on orientation. NGC 891 is a member of a small group of galaxies, sometimes called the NGC 1023 group, which also contains NGCs 925, 949, 959, 1003, 1023, and 1058 as well as UGCs 1807, 1865 (DDO 19), 2014 (DDO 22), 2023 (DDO 25), 2034 (DDO 24), and 2259. Supernova 1986J was discovered in NGC 891 by van Gorkom, Rupen, Knapp, Gunn on August 21, 1986 and reached mag 14 (see IAUC 4248). NGC 891 is contained in the SAC 110 best NGC object list. It is also Caldwell 23 in Patrick Moore's List. In the RASC's Finest N.G.C. Objects Objects list.